KILLINGTON—The Killington Mountain School airbag was up for training this past week, augmenting training for both development and academy athletes. Located at the bottom of Superstar, the airbag provided a soft, safe landing spot as they tried out new tricks. Quite a few athletes hit the airbag over the weekend, from kids as young as six years old—one of whom was landing 720s!—to seniors in high school, who worked on triples and doubles. 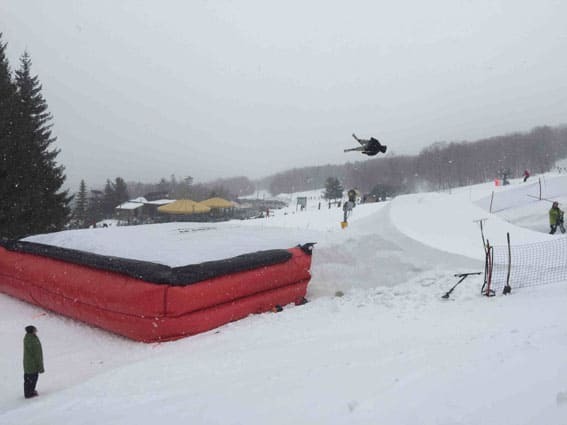 The airbag is an invaluable tool in allowing the older freeski, snowboard, and freestyle athletes to perfect their tricks before major competitions, like Snowboard and Freeski Nationals, which are held the last week in March and the first week in April, Berns said.